Imagine it’s 440 AD; hundreds of Hunnic horsemen pour down the Danube river plundering, maiming, laying waste men & beast alike before they are finally cut down by a disciplined lot of Roman soldiers. This unruly band of barbarians are then quickly put to sword. In a world where we live today such horrendous occurrences surely haven’t abated. We’ve had multiple instances of heinous war crimes in the World wars, Vietnam war, Iran- Iraq war, Gulf wars, Bosnian civil war, Afghan conflict & the Syrian civil war. Economic prosperity across nations has improved the dignity of life. Today, you’ve a reasonable chance of living a quality life & a far greater probability of not dying in some gory war- zone. Empirically, violent conflicts have subsided over the years. Most of the nations today have some sort of ‘Rule of Law’ which guarantees that citizens shall be governed by law instead of arbitrary fiats of government officials & despotic rulers. This guarantees each individual a reasonably ‘fair’ chance for justice. 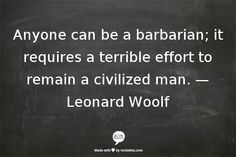 Surely, if ‘barbarism’ were the new norm then we’d have already digressed to things far more capricious. As the internet turns more pervasive in decades to come, the world shall become even more connected. In such a scenario, things that elicit sensation would surely grab more eyeballs & hence, mainstream attention. You’re more likely to hear the savage tales of ISIS than of the good work being done to ameliorate the conditions of Syrian refugees. And if by ‘barbarism’ you actually meant the decay of the concept of morality then, you ought to understand that things as morality are too fragile & diaphanous to remain intact over centuries. At some point in the past slave- trading wasn’t a moral issue rather an abundantly profitable business. Witch- hunting used to be a favorite pass-time among various cultures & in places like India manual scavengers were never the equals of their compatriots. Such concepts of morality & conduct refine themselves as nations progress & prosper thus, they’re always dynamic. Hence, using morality as some cardinal parameter is a flawed logic here.